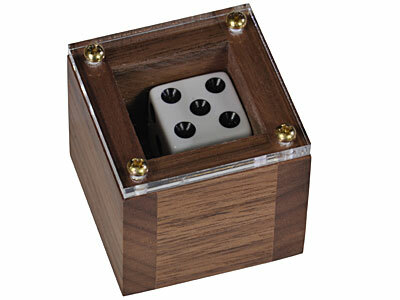 The performer displays a small walnut box with a die sealed within. The die can be seen through the clear acrylic top. A wonderful and colourful story about Badlands Bob begins to unfold. Sadly, he lost his life on the roll of this very die! A spectator is asked to try and change the uppermost number on the die, which he or she soon finds is impossible. The performer then asks the spectator to choose a number between 1 and 6. "If you were Badland's Bob, which number would you have choosen? "The performer simply brings the box up to his lips and gives a soft blow over the surface, and the die magically changes to show the selected number! Instantly resets and therefore is a great walk-around effect. Can be examined before and after. No awkward moves; done right under their noses.Finest quality and a joy to perform. Comes complete with die, secret and instructions. You'll do this 10 minutes after receiving it and you'll perform this often. It's that good!Made by Viking Magic in the USA, this is the original product. Not a cheap copy.1 5/16" square; 1/4" solid walnut sides. Having fun with this one ! Well made and not difficult to achieve the effect as described on their Website. Great trick but have to be very careful to hide the magnet.